The new head of the InvestBulgaria Agency Borislav Stefanov was one of the keynote speakers at the "Banks Investment Money" forum in Sofia. Photo by M3 Communications Group, Inc. Exclusive interview of Novinite.com (Sofia News Agency) with Mr. Borislav Stefanov, the newly appointed Executive Director of the InvestBulgaria Agency. The interview was made during Bulgaria's largest annual finance forum, "Banks Investment Money", June 7-9, 2010, where Stefanov was one of the keynote speakers. Borislav Stefanov was formally appointed Executive Director of the InvestBulgaria Agency, a government body facilitating relations with foreign investors, on May 24, 2010, after his predecessor, Stoyan Stalev, quit the job. Stefanov graduated with a BA in business administration from the American University in Bulgaria, a Masters in international management from Regent’s Business School in London, and a MBA from the Harvard Business School. He has worked at the Moscow office of the Boston Consulting Group (2007-2009), where he participated in projects in Serbia, Poland, India, and Russia. In 2003-2005, he worked at DaimlerChrysler in Dubai. He has also been a sales and development director at Lada Image, a subsidiary of the Russian company Avtogaz. 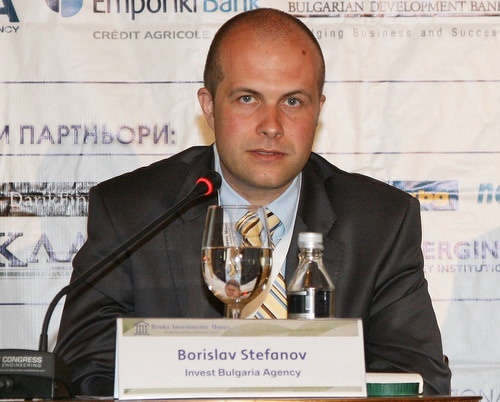 On December 17, 2009, Stefanov was appointed the Deputy Director of the InvestBulgaria Agency. You became the Executive Director of the InvestBulgaria Agency only a few weeks ago. What are the new things that you plan to introduce in the work of the Agency, what should current and future investors expected from you? I will do my best to maintain good relations with the big foreign investors in Bulgaria. I have already attended several meetings – with the US, Austrian and Greek investor chambers in Bulgaria as well with some of the biggest international investors. We will try to expand and improve the communication between the Agency and the foreign firms. We will also work to facilitate better the feedback and the interaction between the state administration and the foreign businesses. I personally believe that this is one of the best possible ways to get into the specifics that the investors would like to see improve here, and to learn their views on Bulgaria’s advantages and disadvantages as a business destination. Second, one of the things that I am going to emphasize in the work of the InvestBulgaria Agency will be focusing relatively quickly on proactive marketing. Because at present we do have qualified experts that respond to investment inquiries – in 2009 there were about 250-300 such inquiries asking for specific information about business conditions, raw materials, labor resources, prices, etc. But the fact of the matter is that we are still working only with the firms that contact us, i.e. the Agency doesn’t go out looking for clients, to put it this way. This is precisely one of the things that I would like to change quickly. There are two obstacles to this, however. One has to do with money, and the other – with the human resources that we have at our disposal, i.e. we need people who can cold call companies, and know very well how to do that. This requires a potential that we do not have for the time being but which we will try to develop. We are also planning to boost our cooperation with government and non-governmental organizations in order to craft a large-scale mechanism for cooperation so that we can utilize the advantages of the InvestBulgaria Agency – which largely have to do with its status as part of the Bulgarian government and the ensuing connections from that. On the other hand, this should help us to expand our marketing activities. This is the first major change; the second one, as I already mentioned, is related with communication. I think that the stable permanent connections of the Agency with the large-scale certified foreign investors in Bulgaria is crucial. It is true that our Agency does not have the powers of ministries or local authorities to issue construction or other kinds of permits but our aim is to make interaction between the state and foreign companies more efficient. I think we have a lot of work to do in terms improving our communication because this is a matter of organization, it does not require money or much else in the form of resources. According to data of the InvestBulgaria Agency, Bulgaria registered a negative net balance of EUR 22 M of foreign direct investments in the first quarter of 2010. Do you see a trend in this development? What do you think has caused it? I don’t think this is a trend, at least not for the time being because the total FDI balance for the first quarter is negative but if we take each month individually, this is not the case. In January, we have a positive FDI balance of EUR 50 M, in February – positive EUR 90 M, and only in March we have a negative balance of EUR 160 M, which leaves us with the final net investment outflow of EUR 20 M. So I hope that this will not turn into a trend. There are a couple of other things indicated by this data set which are more important, in my view. One of them is the rising number of foreign firms investing in Buglaria. A total of 1 400 foreign companies invested in Bulgaria since the beginning of the year. Of these, 1 000 have a positive FDI balance, and about 380 have a negative FDI contribution. So this is a big difference. What is more the number of companies withdrawing investment is stable – about 120 each month, while the number of those contributing positively is on the rise – more than 200 in January, more than 300 in February, and more than 400 in March. The other positive indicator is that capital stock investments are increasing, and this is the most “classic” form of investment. This is when a foreign company opens a Bulgarian branch and invests money in equity. These investments are more traditional and easier to forecast; if we started to see an outflow of capital stock investments in Bulgaria, we would be a lot more worried. Because what we see now are transfers because of inter-company debts. Of course, these transactions are not good for the country inasmuch as every outflow of investment is bad but on the other hand they are not connected with capital stock, and depend more on the specific company strategy. These transactions are bad for our estimates because they are difficult to forecast but they are not that worrying especially if they only occur within one or two months. At about the same time the negative FDI balance was made public, the National Statistical Institute released data showing a 400% increase of foreign investments in the non-financial sectors for the first quarter of 2010. Why do you think that is? Which are the economic sectors that Bulgaria should focus on, in your opinion? I know that it would sound much better if I were to say that we will focus on three major industries, and we will set up five industrial zones. However, I don’t want to commit to only a few economic sectors before extensive research has been done under a new project that we are starting - especially in a time of economic crisis with high unemployment and reduced FDI inflow. Against this backdrop, all foreign investments in all sectors are good for Bulgaria. Of course, sectors with high surplus value are better. A research and development center is a better investment for us than a call service center but this does not mean that we should reject investments in call centers. I think that on the one hand the explanation for the 400% growth of foreign investments in the non-financial sectors in the first quarter has to do with the fact that over the last 4-5 years Bulgaria saw enormous investments in finance and banking. I think they were about 30% of the amount of FDI in that period. This is normal and very important because banks drive growth and development. Much of the foreign investment actually comes in the form of loans to the banks before going into other sectors. It is only expected that now that crediting is on the decrease the financial sector would not grow as much as it did in previous years. At the same time, investment in certain industries in Bulgaria has been low so for some of them only the arrival of one large multinational corporation in Bulgaria would be sufficient to record a growth of several hundred percent. This is one of the key features of the investments in Bulgaria – small firms dominate the Bulgarian economy to a large extent but at the same time, as far as investments are concerned – in the last 5 years 10% of all foreign investors gave almost 100% of the total invested amount, while the other 90% provided only 2-3%. That is why one large foreign company can change the statistical data substantially. The previous government had a plan for the creation of 100 “Chinese-type” industrial zones around Bulgaria in order to attract outsourcing investments. Do you think that this was a plan that was feasible and suitable for Bulgaria? I think that the industrial zones are a major means of attracting foreign investment inasmuch as many of the foreign companies coming here are interested in Bulgaria as a place where they can conduct the same production and business operations as they do elsewhere but at a lower price. This is why the specific conditions are crucial for them, i.e. they want to arrive in Bulgaria today and start doing business tomorrow, almost immediately. This means purely technical problems with infrastructure, roads, permits, electricity supply, communications can slow down their projects to such a degree that they might give up investing in Bulgaria. In this respect, industrial zones are a great solution because they provide completed infrastructure and permits and a firm can just move in and start working. Now, I don’t know if we will have 100 industrial zones. There are various examples in Europe. Countries such as the Czech Republic and Hungary – which are comparable to Bulgaria in size – have a lot of industrial zones. One of them has almost 100. I am not certain yet which would be better – establishing several industrial zones that are fully ready or building more of them at a cruder stage, leaving their completion to the investors. This is a question of the competences of various consultants. As far as I know, the National Company “Industrial Zones” is going to develop these projects, and it is researching actively which option would be best for Bulgaria. You have mentioned that your Agency is proposing amendments to the Investment Encouragement Act. What are these changes, and how are they going to improve the investment climate in Bulgaria? We have positive discrimination for certain industries in Bulgaria, like research & development, and high tech services. Besides we have proposed the introduction of a new category of investment projects. These so called “priority projects” will be investments, which create a significant number of new jobs and result in the inflow of a large amount of foreign direct investment to the country. In general, the criteria for state aid for investments are set at BGN 100 M and at least 200 new jobs. At the same time, state support for these projects will be more substantial – there will be a number of new measures, one of which envisions direct financial support for priority projects. In the generic case, the government will cover up to 10% of the investment after some milestones in the investment project have been met. In manufacturing, these thresholds are lowered to BGN 50 M, and 100 jobs; in research and development activities they are BGN 20 M and 50 jobs, and the state aid can go up to 50%, which is the maximum amount allowed by the European Union regulations. As I mentioned, we are trying to attract everybody – I think it is important in these conditions – but we are also trying to target certain sectors. You have announced that your agency is starting a new three-year project to promote Bulgaria abroad as an investment destination. What does that project consist of? First, within a few weeks we are going to start the first tenders to select strategic consultants for our economic analyses and marketing strategies. Government tenders take about three months by law, after which we plan to have a list of industries with a great potential for development and for attracting investments in Bulgaria in another three months. This does not necessarily mean the industries that are currently forming the backbone of the Bulgarian economy, they cold be industries which do not even exist in Bulgaria yet, but show great potential. Our goal is to identify the ones where we can attract foreign capital quickly and efficiently. After that we are going to determine the target countries and to craft a marketing strategy on how to go about approaching the companies there. All that should be completed by the end of the years. From then on, until the end of the project in 2013 we will focus on carrying out the respective media and marketing activities. We want to have a series of advertisements in leading international media as well as several events – perhaps 15-20 events in various countries around the world in connection with the industries that we are trying to attract. If you have to sum up Bulgaria’s top three advantages as a foreign investment destination in addition to the very low corporate and income taxes, what would those be? First, its location near key markets – the EU, Russia, Turkey, the Middle East; second, its political and macroeconomic stability, including its membership in the EU and NATO; and third, its qualified human resources and talent. You meet with foreign investors on a daily basis with foreign investors but Novinite.com (Sofia News Agency) is a media outlet that also provides you with the opportunity to address them directly. What would you like to tell the foreign investors who make up the majority of our readers? First, I would like to stress that we are open for all kinds of contacts. I have already emphasized the importance of communication between the government and the businesses, and the fact that InvestBulgaria Agency has been working primarily with the largest investors in the country. We are going to keep working with the companies that have invested dozens of millions of euro but we will seek to reach out to medium-sized investors as well. We would like to receive as much feedback as possible from foreign companies about what they like or dislike when doing business in Bulgaria so that we can think about how to resolve these problems, and how to promote the good things here. Second, I would like to call upon all those foreign companies that are happy with their work in Bulgaria – I want to tell them that they are the best means for promoting Bulgaria abroad. This is the job of our Agency but it is also seen as part of the government, i.e. an actor that is not objective, so it is very important to us if representatives of foreign businesses can help us promote Bulgaria’s advantages internationally.